Properties in Beaumont-en-Argonne average 4.5 out of 5 stars. 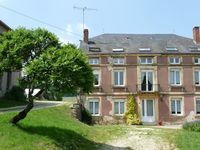 Property 8: Spacious cottage in an authentic farmers house with heated Jacuzzi and panoramic views. A very pleasant family cottage. The property is simply lovely ! It has everything you need and is perfect for bigger groups with lots of space and a lovely garden that is safe and secure and the pool is a fabulous feature ! Just a note it says towels provided this is only hand towels so take your own ! But this is a gorgeous part of France and a great location near to Belgium also ! The owners are stated as only speaking French but their English was fair and they were able to tell us everything we needed as we speak little French ! A great place we will return to ! The cottage is very well equipped (not luxurius but plenty of space, all you need, and of course, the outdoors jacuzzi is very cool and relaxing!). The owners are very nice people, and the location of the cottage is very close to Parc National des Ardennes so if you like hiking/walking like us, it is a good destination to go. For the price you pay is also very good. I would recommend it.